Breaking ranks with convention may be the norm for indie developers, but it's a rare occurrence for hardware manufacturers. When said conventions exist to tempt 'enthusiasts' it's a particularly risky move - making GeIL's decision to buck the trend with its Black Dragon memory so surprising. Not only do these sticks refrain from employing lots of ridiculous superlatives in their name, but (and this is shocking) it boasts absolutely no water-cooling connectors, heat pipes or even heat spreaders. Naked, as it were. Admittedly a pair of LEDs are used for the dragon's eyes, but even these are fairly subtle. 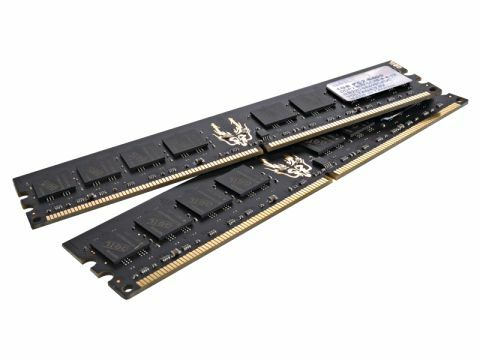 Don't let the lack of a cooler fool you into thinking these sticks can't deliver either - in fact they're some of the fastest 800Mhz memory we've seen. The 4-4-4-12 latency timings at 800Mhz offer up an overall memory latency in Sandra of 80ns with a throughput of 6.6GB/s (compared to 88ns and 6.4GB/s from a pair of OCZ's excellent ReaperX). In practical terms you're looking at adding at least a couple of frames to the likes of Crysis and Half Life 2, and possibly a lot more if you're using more mundane memory. At £42 a pair, these offer reasonable value, but grab the 4GB kit for a shade over £60 and you're laughing.